Spektakuläre Zweifamiliengebäude verfügen über geräumige Grundrisse ... Großes Wohnzimmer und Schlafzimmer verfügen über einen Balkon mit Meerblick. Aufzüge, ein gemeinsames Parkhaus (mit sieben Fußfreiheit im Erdgeschoss), Pools am Meer und Whirlpools. Erste Bettwäsche eingerichtet, Haushaltshilfe beim Check-out. Keine Haustiere erlaubt. We had a wonderful time stay at this place. The location was great!! It was far enough away from Myrtle that we weren't too burdened with Bike Week traffic, but it was just close enough that it didn't take too long to get to things, like Broadway. The property itself was great. If you're concerned with decor, then this might not be the place for you. The decor is a little outdated, but for what we wanted, it was perfect. The view was amazing! There's are 2 hot tubs, and 2 pools, if the beach isn't your thing. As far as the rental process, it was seem less. We found a place that fit what we wanted, sent an email. Within a few hours, we were booked. Unfortunately, we got to the rental agency at the time they were closing, and transitioning things to the security guest, but that still went very smoothly. We tried the Conch Restaurant, which is just a short walk up the beach. The food there was pretty good. 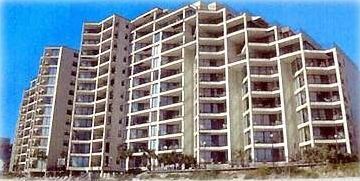 Both piers (Garden City and Surfside) are both in short walking distance (1 - 1.5 miles). We could not have asked for a better weekend! Thank you very much for allowing us to enjoy your condo for the weekend! I'm glad you had a wonderful visit. Myrtle Beach is a great place to vacation and Garden City is a perfect location.. still close to downtown but far enough away. Garden City and Surfside are known for a more family style atmosphere. Thank you for review. I'm glad you enjoyed your stay. Typical "in-season" rental is Saturday to Saturday. Contact owner for information.